A new and improved Coggins form! Here at Southern Equine Veterinarian Services we are always on the cutting edge of technology and information and we plan to keep apprised of what are the best, most efficient, and cost effective ways to treat our patients, your horses. Whether it is a promising new experimental drug, or the latest release of treatment plans and protocols, we always offer our clients the assurance that we have the best possible resources to refer from and in turn they know that we are serious about the care of their horse. 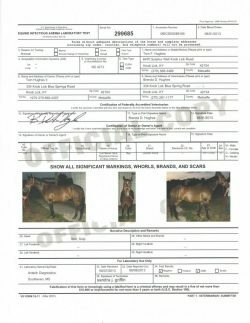 Your horse’s Coggins form may be retrieved by simply sending an email to [email protected] and indicate you would like access to your horses Electronic Coggins Form and we will promptly send you the needed documents. Photographs will be taken from the right, left and front of your horse. Please have blankets off and horses clean prior to the veterinarian’s arrival. Remember, these photos will stay on your horse’s permanent record, so you want him to look his best! Finally, remember that if you do not provide us with an email address, you will not be able to access your horse’s eCoggins. All electronically generated thus a more professional & neat looking Coggins form!! So when you have your next Coggins pulled by Southern Equine Veterinary Services, have your horse looking his best for his photo shoot. (Photos can be updated from year to year if you wish. )Example of: Coggins and New Certificate of Veterinary Inspection!